Hakusan, Japan July 28, 2011 – Eizo Nanao Corporation (TSE: 6737) today announced the release of the RadiCS monitor quality control (QC) software Version 4 and RadiNET Pro network QC management software Version 4. RadiCS checks and calibrates the display quality of monitors to consistently ensure refined rendering of medical images. RadiNET Pro enables centralized QC management of multiple monitors via an intra-hospital network. EIZO has been developing these applications since 2004. Even though the importance and necessity of monitor quality control are recognized in hospital facilities, QC matters are often not addressed due to the restriction in human resource and time. EIZO has overhauled RadiCS and RadiNET Pro to help hospitals address QC matters more quickly and easily in Version 4. New RadiCS Version 4 features a substantially improved user-interface which reduces the complex workflow of QC. Graphical design and icons are arranged next to the text making it easy to comprehend the functions visually and intuitively. A compendium list also enables users to check the condition of monitors instantaneously. Furthermore, this version simplifies operability such as gaining access to necessary information with just one click of a mouse. RadiNET Pro Version 4 incorporates a tree view which makes it easy to visually capture the structure of all controlling monitors. Also, this version supports various resolutions which increase the flexibility of the layout. EIZO will demonstrate RadiCS Version 4 and RadiNET Pro Version 4 at RSNA 2011 (97th Scientific Assembly and Annual Meeting of the Radiological Society of North America) to be held from November 27th – December 1st in Chicago, USA at the McCormick Place. EIZO will be located in booth #3814 of the South Building Hall A. A warning icon appears on the desktop taskbar when the monitor fails a QC check such as a constancy test. Acceptance and constancy test report generation possible with just one click of a mouse. Acceptance and constancy testing time reduced by 21% (EIZO's internal measurement) compared to conventional software. "Monitor List" window with location, department, and room of all controlling monitors is displayed in tree view for easy visual understanding. Supports display of various resolutions. Mozilla Firefox now supported by administrator PC. 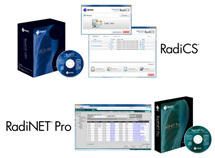 Release of RadiCS Version 4.0.0 and RadiNET Pro Version 4.0.0 is scheduled for August of 2011. Availability varies by country so please contact the EIZO subsidiary or distributor in your country for details. All product names are trademarks or registered trademarks of their respective companies. EIZO, RadiForce, RadiCS and RadiNET are registered trademarks of Eizo Nanao Corporation.